Estelle West, illustrious author of The Noble Nine novel series, is on her death bed. West’s eight estranged grandchildren (a loyal hamster completes the nine) reunite and reminisce over their childhood adventures when they were the inspiration for dear Noona’s tales. Idyllic memories of simpler days spent picnicking and watching the otters frolic expose bitterness and tension towards tomboy Bammie (Claudia Grant) who is now engaged to Hank and a functioning adult. With Estelle’s shock reveal that their inheritance is hidden as gold in the family mansion, the grandchildren visit the remote island where they spent their childhood for one last caper. But will it ever feel the same again? Dark secrets of the past are unearthed, unleashing a bloodthirsty brawl to haunting chants of ‘leave it to the nine’. In the damp warren of tunnels below Waterloo station Toby Vaughan as a wide-eyed presenter comically totters into the cavern to set the scene. Vaughan succeeds in captivating the audience in all his roles, later appearing as perishing Estelle and as an overbearing estate agent. Whimsical Winnie (Ella Bruccoleri) and Oldest Arthur (Ryan Dooey) are memorable as the trailblazers of the group, bringing a psychotic twist to our Edith Blyton childhood fantasies. This is offset by Bookish Hen, the reluctant cousin, physicalised nicely by Willy Hudson. Jennifer Leong, Dipo Ola and Claudia Grant complete a strong cast. Performing in a damp-smelling subterranean space is in some ways an atmospheric backdrop well-suited to this adventure. Theatre Tewl capitalise on the long stretch of space between the audience as the nine hunt around the manor for treasure. Lighting is used playfully, and the lack of set design seems fitting. Unfortunately, dialogue is often lost due to inevitable background noise and the feat of staging scenes to be visible to all. Nonetheless the abundance of witty jokes is well-received. Polina Kalinina’s direction and Matt Parvin’s writing have strong potential but need fine tuning to ensure the completeness and consistency of this spoof. The piece has a slow start but gets stronger throughout to pack an unexpected and gripping finish. The overarching plot which sees relationships unravel and depicts a desperate need for the out of touch troupe to save the day is at points sensational. Particularly hilarious touches included Oldest Arthur’s recurring preoccupation with German spies and Romantic Gregory’s struggle to revive his poetic skills. This is a promising debut play from Theatre Tewl with strong foundations for a thrilling and unmissable dark comedy. Stella Saxby, 12-year-old heir to Saxby Hall, awakens bound in a bed at the will of her awful Auntie Alberta. Told that her parents were killed in a tragic car accident, all is not what it seems when auntie suspiciously mentions the ‘deedly weedlies’ for Saxby Hall. David Walliams’ best selling book is brought to life by Birmingham Stage Company and the talented adapter and director, Neal Foster. With all the mischief and mayhem of Dahl’s Matilda, Awful Auntie is a dark comedy-thriller, with the mood captured perfectly in Jackie Trousdale’s marvellous staging. The gothic set features spectacular rotating turrets made for giddy chases in and out of rooms and chimneys. Puppets are creatively used throughout the play, crossing the expansive grounds of Saxby Hall to evoke the exhilarating sense of adventure of Walliams’ book. Wagner the Bavarian Owl is an exceptionally-made puppet, artfully managed by Roberta Bellekom. Georgina Leonidas plays the resilient Stella with youthful energy and vigour. Despite her captivity and the fatal loss of her parents, Stella is rather unemotional which could explain the sense that something is missing throughout the show to make the audience really root for her. The lack of emotion becomes particularly apparent with the out of place class moral wedged on the end of the play. Despite this, scenes between Leonidas and the cockney ghost chimney sweep, Soot, have a playful innocence all set to the background of Jak Poore’s atmospheric score. The endearing, wide-eyed Soot is played humorously by Ashley Cousins, who previously starred in Gangsta Granny. Awful Auntie Alberta (Richard James) is a Miss Trunchbull character with a sizeable dash of pantomime dame. The shrill dame voice is slightly grating in an overly-wordy opening scene that sadly falls flat. Fortunately, poo and trump gags win the young audience’s attention. The second act livens up with slapstick humour and a more villainous Awful Auntie appearing. The electrocution chamber that Stella is locked in feels slightly inappropriate but luckily only parents and not their children seem concerned about it. 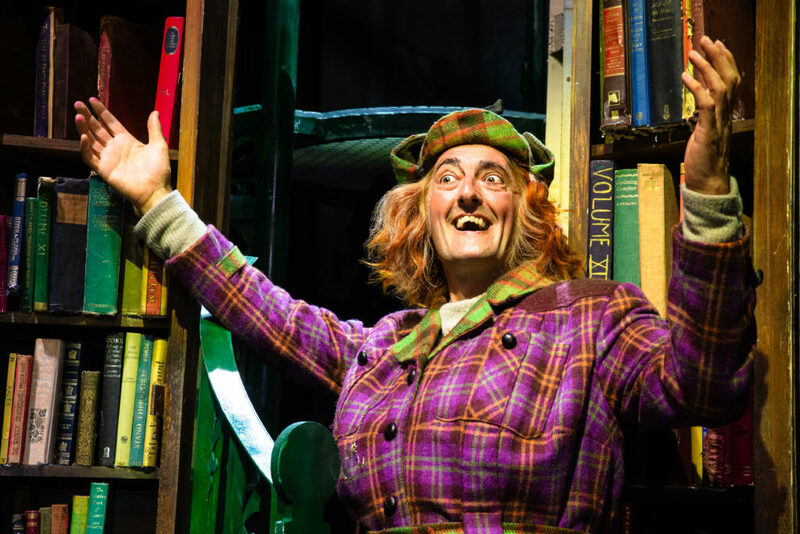 Awful Auntie doesn’t quite follow in the footsteps of Gangsta Granny but for the book’s fan base it is no doubt a delight to see the antics brought to the stage with imagination and charm.